After an evening of playing football with some of Nis’ welcoming and generous teenagers, we slept a last short, sweet night in our Oak Hall tents. Here is a photo of some of our new friends from Nis – “Come back soon!” – their parting words. We’d love to. – Mira as we left this afternoon. – Dragana, 13 years old and addressing all of us with poise and maturity – she has lived as a refugee since she was 2. – Romans 5:8 – the verse we read and thought over together as we stood in front of the refugee homes. 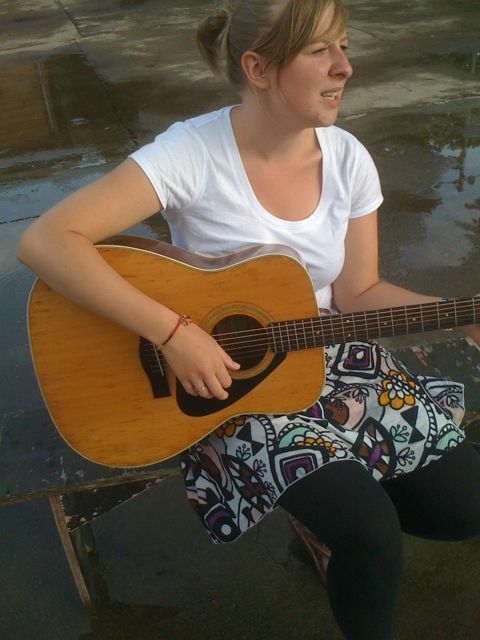 – Anna singing a Paul Oakley song to all 150 of us. We’re now leaving the motel camp following a generous and warm welcome from our friends here. We’ve all been drinking Turkish coffee in the small rooms that are now “home”. Some of these refugees fled from Croatia in the early nineties and were resettled in Kosovo only to be “ethnically cleansed” a second time… It is hard to comprehend the heartbreak they have suffered. 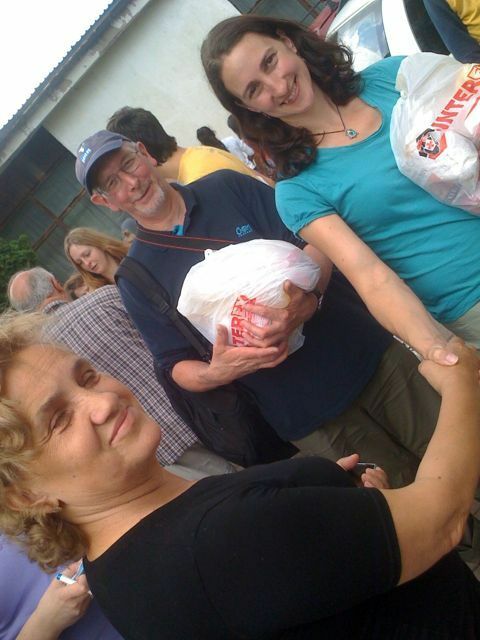 Below are photos of the aid being distributed – always slowly, personally,with a smile and a signature. We are at our the point furthest south that we will reach on this epic journey. 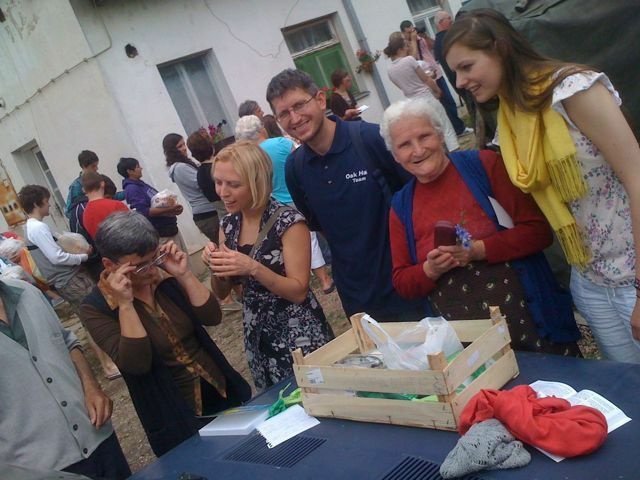 Here at this camp our two opticians are fitting reading glasses while the rest of us deliver the aid we have brought and chat with these people who have been through so much. Darko – a graduate of the Bible college continues to spend a lot of time each month with these refugees and a number of the children will be coming away on holidays he and others in CEF have organised for them. 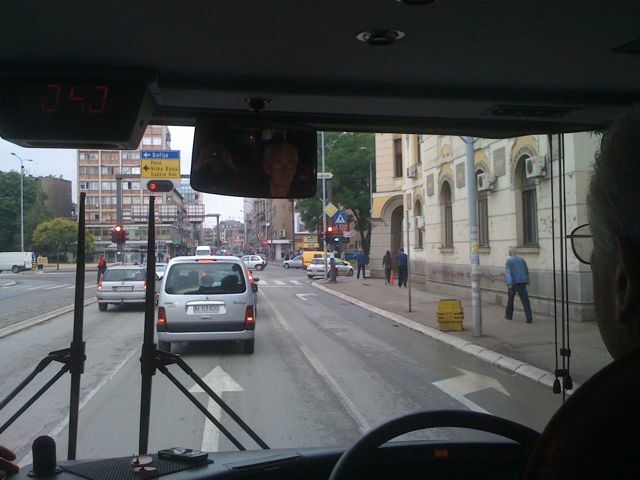 We are on the road and driving out of the centre Nis. Our sites are set on Bujanovac – a town squeezed against the eastern border of Kosovo. Eleven years ago, Bujanovac was to be the temporary solution for the refugees fleeing Kosovo. Yet in 2010 they are still here. We will visit four camps. The first is made in the temporary huts for the workers of a now closed brick factory, the second in an abandoned and unfinished school bulding, the third an obsolete motel and the last temporary wooden homes. These refugees have become our friends over the course of earlier visits using vans and smaller vehicles. They are looking forward to more of us coming together and are amazed that we should have come overland a total of 2500 kms to reach them. Through the day I will try to send short bursts of news of what is happning. Greetings from all on this coach. We travelled to Niska Banja – famous for its ﻿radon-infused hot springs – some dipped in their feet, the most courageous swam… We wondered whether any of the group would glow after this exposure! In the afternoon we explored the city of Nis and in the evening returned to our makeshift camp at the school… again many local residents joined us – first for a meeting in the sports hall, then for hot chocolate and some games of basket ball. For the last hour of the evening, we have been working to prepare packages for the four refugee camps that we ambitiously plan to visit tomorrow. It’s going to be a massive day – we hope to be on the road at 8:30am and we will return around 9 in the evening having driven around 300 kms on small roads down through the corridor between Kosovo and Bulgaria. Although we have visited these camps before, we have never taken an Oak Hall coach this far south. There are hundreds of people in these camps – again forgotten by most of the population as well as by the international community. We will try to keep you posted as tomorrow unfolds – greetings from us all!